Click here to download our Return Shipping form. It includes return instructions and policy information. 3. How do I find the right parts for my Mini/MINI? On the left hand side of your screen you will see an option to tell us about your car. We ask the year, model, body and transmission. Enter this information and we will only show you parts and accessories that are compatible with your car! 4. What model is my Mini? 5. What if the item I am looking for is not on your website? Give us a call at 1-800-946-2642. We have a wide range of suppliers and may be able to help you special order what you need. 6. Do you provide technical guidance and installation instructions on your products? We will help you to the best of our ability. 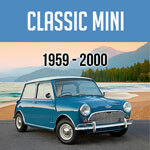 With more than 100 years of combined Mini experience there are rarely questions we can't answer. 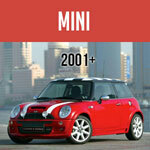 When that happens, we urge you to ask on our Mini Cooper Forum. There are dozens of very knowledgable members that love to give their two cents. 7. What do "OEM" and "Aftermarket" mean? Aftermarket: This is a fancy word for generic. Many aftermarket products are not only comparable but higher quality than OEM. We will accept VISA, Mastercard, Discover and American Express. This includes Debit Cards bearing one of those logos. 9. What other payment methods do you accept? You can also pay for your order by using PayPal. Our site is very secure, but if you feel safer sending in a check or money order please call us at 1-800-946-2642 and we will happily have that arranged. 10. What is your coupon code policy? From time to time we offer specials and discounts using promo/coupon codes at checkout. These codes do not apply to special order items and/or items already on sale. Limit one promo code per order. Mini Mania headquarters is in beautiful Nevada City, CA nestled in the Sierra foothills. We are located at 870 Gold Flat Rd, Nevada City, CA 95959. 12. Is there Sales Tax on my order? Sales tax is applied only to orders shipped to California. Current sales tax is 8.375% because our orders are shipped from Nevada City, CA. 13. Do you offer international shipping? If you prefer to use an alternative international shipping method then call us at 1-800-946-2642. Please feel free to ask us questions in the comments section below.